Hamilton, Bermuda (AP) — In light, shifty winds on the turquoise waters of the Great Sound, Peter Burling and Emirates Team New Zealand made fewer mistakes than Jimmy Spithill and Oracle Team USA and won the first two races of the 35th America’s Cup. It wasn’t the cleanest start to sailing’s biggest regatta, leaving more questions than answers as both teams headed back to their bases to pore over data and figure out where they need to sharpen up. Although they won twice, by 30 seconds and 1 minute, 28 seconds, the Kiwis lead just 1-0. Oracle earned a bonus point for winning the qualifiers, but it was actually a negative point for the Kiwis, so the first-race win merely erased that. That means they need to win eight races total to spirit the Auld Mug back to the Royal New Zealand Yacht Squadron in Auckland, where it resided from 1995 until 2003. Oracle needs to win seven to keep the silver trophy in the hands of American software billionaire Larry Ellison. Other than the Kiwis remaining fast in light conditions, there’s not much of a conclusion to draw yet. After all, the 2013 America’s Cup proved that no lead is safe. This is a rematch of that epic regatta, when Team New Zealand, then skippered by Dean Barker, reached match point at 8-1 before Oracle Team USA won eight straight races on San Francisco Bay to retain the oldest trophy in international sports. Still, this isn’t the start the powerhouse Oracle squad expected. Burling, who has won Olympic gold and silver medals with grinder Blair Tuke, again appeared unflappable. He is an America’s Cup rookie. Spithill, an Australian, is trying to win his third straight America’s Cup before he turns 38. For a few dramatic minutes, it looked like Spithill was going to salvage a split of Saturday’s races. The American-backed crew benefited from a wind shift sailing upwind on leg five in the second race and made up a huge deficit, pulling right behind the Kiwis sailing through the gate mark. 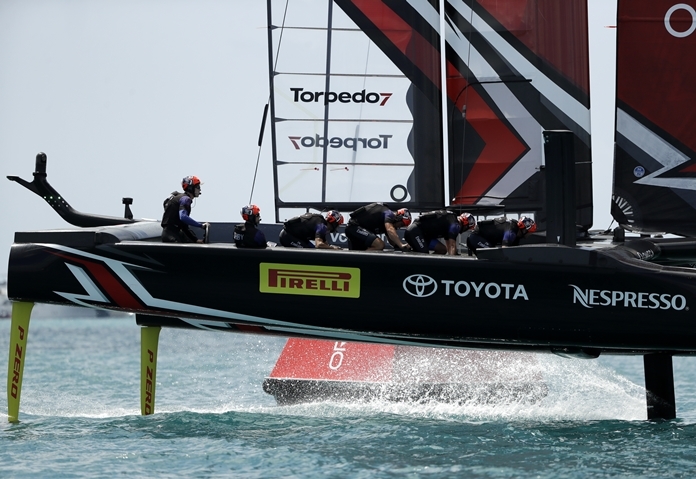 But its 50-foot catamaran came off its foils during a bad gybe and buried its bows in the water, allowing the Kiwis to speed back ahead and open a lead of more than 300 yards. Spithill thinks the splashdown was caused by a problem with one of the rudders. The low-key Kiwi crew shook hands after crossing the finish line of the second race just off the America’s Cup Village on the site of a former Royal Navy base. Races 3 and 4 are scheduled Sunday. The Kiwis snapped a 10-race losing streak to Oracle, including eight at the end of the 2013 regatta and two in the round-robins this year. In the first race, Spithill was over the starting line early, forcing him to drop two boat lengths behind to clear the penalty. The Kiwi catamaran rose onto its hydrofoils and sped ahead. But the Kiwis later came off their foils during a difficult maneuver and slowed dramatically in the tough conditions, losing half their lead. They had enough of an advantage to hit the line well ahead. The always-innovative Kiwis are using a “cyclor” grinding system. They’ve built four stationary cycling stations into each hull to tap leg power instead of traditional arm power from the grinders to power the hydraulic systems that control the wing mainsail and the daggerboards.